Hendricks County has had four jails in its history, with each located in Danville, the county seat. The first two jails were located on North Washington Street just north of the court house square. The third jail and Sheriff’s Residence (Now the museum building) was built in 1866 at 170 S. Washington Street. The jail facility had two sections, one for the women and the other to house the men. The “Ladies” area had two cells, with a shower located in the rear of the cells. Generally, within a year the average number of women prisoners was between fifteen and twenty-five. The Men’s area contained four cells. 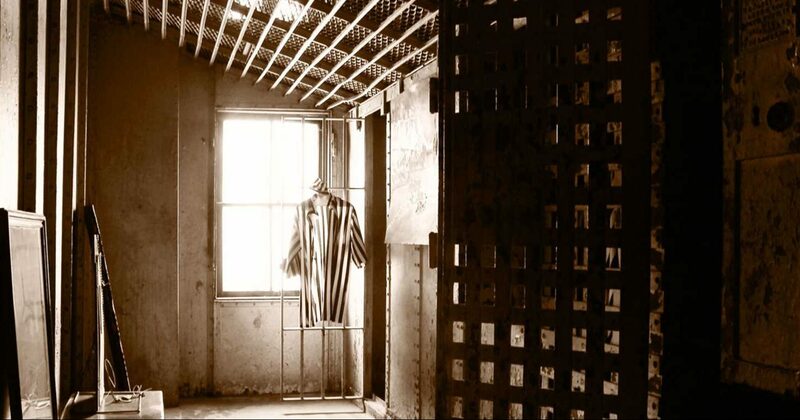 Each cell contained two bunks, with wall brackets mounting two more above. Originally, hammocks were used as bedding. Later, mattresses were provided to sit on the steel racks. A shower was added to the women’s and men’s area when plumbing was added to the facility. Early inspection records indicated that prisoners bathed in a metal tub. The jail was used from 1866 until August of 1974, when the present jail was built. Visitors may go into the cells to view the graffiti on the walls and imagine what it was like for the inmates. If you would like to lend time with a tour, exhibits, collections there is a place for you. Contact the museum (see below) and we will fit you with your interest. The museum's financial operation is dependent on memberships, donations and grants. Please consider supporting the museum. Gifts can be given "In memory" of a loved one or "In honor" of a friend. To request a scheduled tour, fill out the form on our tours page instead. For everything else, contact us by submitting the form below, or call 317-718-6158.